Travel lovers spend each vacation in different parts of the globe so they can experience diverse cultures, lands and people on this fantastic planet. However, something special overcomes the traveler that visits a Greek island. When travelers vacation to Greece and the Greek islands, they find themselves longing to return – and they often do. What is it about a Greek Island that draws travelers to its pristine beaches, historical attractions and sumptuous island fare year after year? There is so much we could share about travel to Greece, but there is only one way to understand why Greece and the Greek islands are your vacation destination of choice – and that is to experience Greece and the Greek islands on a Hellenic Holidays vacation. On a Hellenic Holidays vacation, spend your days seeing history come alive as you discover Greece, its history and culture with our knowledgeable guides and our world renowned insider-access opportunities. Experience the superb landscapes, the whitewashed buildings and picturesque fishing villages. Our exclusive focus is providing the ultimate Greek island experience you want with our award winning itineraries for you – our treasured clients. Stop dreaming about visiting the Greek islands and let Hellenic Holidays, the leading travel company for vacations, weddings and honeymoons in Greece and Turkey, make your dream journey to Greece a reality. Immersed deep in the history and culture of Greece, the capital of Greece, Athens portrays a beautiful blend of the past with the future. It offers several of the world’s most significant archaeological sites, monuments and museums. The magnificent Parthenon atop the Acropolis constantly reminds us of this ancient city’s unforgettable past. Plaka, the oldest neighborhood of the city, at the base of the Acropolis exhibits the vibrant tavernas and lively street markets. Thirty minutes from downtown, Athens shows us is other side, the Apollonian coast. In the summer, you can easily experience many of the Athenian Riviera beaches for a day or can escape to nearby islands such as Aegina, Hydra and Poros for a day or two of sun and sand. Mainland Greece offers a variety of attractions ranging from natural wonders to archaeological sites. Sprinkle in picturesque villages, authentic cuisine and warm local hospitality in the Peloponnese, Delphi, and Meteora and mainland Greece comes to life. The changing landscapes of rugged mountain scenes and simple seaside resorts will enchant travelers visiting the mainland. As the largest island group in Greece, the Cyclades are the quintessential summer destination. 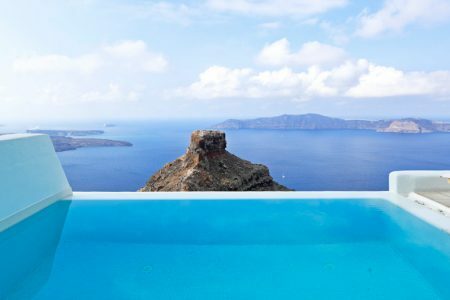 While natural diversity is abundant on the islands-from the dramatic cliffs of Santorini and the sandy beaches of Mykonos, to the lush valleys of Naxos – you will not have to venture far to find whitewashed homes, blue skies, a sea of infinite blue, and sun. Mykonos is the crown jewel of the Cyclades. Famous for its superb landscapes, traditionally whitewashed dwellings and crystal waters, it has surprisingly retained the characteristic charm of a port town. Nothing can detract from the beauty of its famous windmills, and its sandy beaches. The sacred island of Delos, once the Sanctuary of Apollo, is just a short boat ride away. A white & blue life-time experience! Santorini is unlike any other place on earth. The original circular island was blown apart nearly 3,000 years ago by a fierce volcanic eruption. The main town of Fira is clustered along the cliff edge and plunges almost 900 feet into the sea. Santorini is not only sheer cliffs, for its outer coast has incredibly long black volcanic beaches. The major archeological site of Akrotiri, where part of a Minoan settlement is being excavated may prove to be a new Pompeii. Paros is one of the most attractive of the Cyclades, it offers numerous white sandy beaches throughout the coast, while the interior is almost entirely taken up by Mt. Prophet Elias. It has an interesting archaeological museum and amongst its many treasures is the statue of the Wingless Victory. Although not yet well-known as Mykonos or Santorini, Paros offers a vivid night life and interesting boutiques. Naxos is the largest island of the Cyclades, charming with lush vegetation, amazing beaches and lively history. It is still mostly unexplored and for those seeking privacy, this is the place. 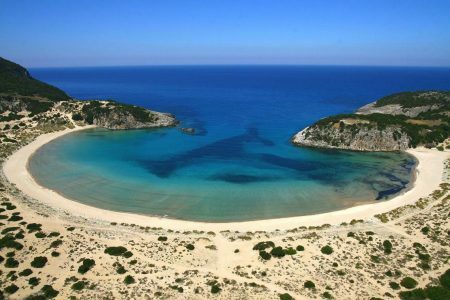 Lord Byron called Naxos his “dream island” and it has since become many other people’s idea of a Greek island getaway. Crete is the largest Greek island. Its spectacular soaring mountains and dramatic gorges as well as vast plateaus and coastline of beautiful sandy beaches will leave you speechless. The island straddles the Mediterranean and North African climate zones, and has pleasant weather throughout the year. The island’s historical importance, however, cannot be overlooked. 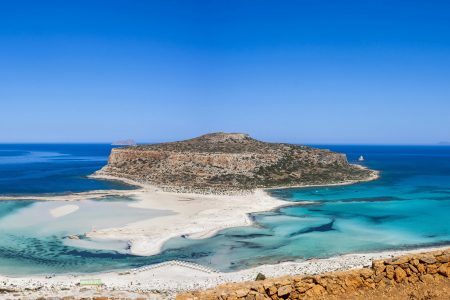 As the seat of Minoan civilization, Crete has a rich archeological history that can be seen throughout the island ranging from the archaeological site at Knossos, a few miles from the busy port city of Heraklion, to the Venetian fortresses of Rethymnon. The island group of the Dodecanese is fast becoming a very popular summer destination. Rhodes is the largest of the Dodecanese islands, and exemplifies a well preserved crusader city. Here, the narrow streets are unchanged with their Medieval Inns, the Place of the Grand Masters and the city walls, originally built by the Knights of the Order of St. John, all surround the Old Town. In Lindos, everything is recognizable as ancient and classical. Lindos the most beautiful spot on the island offers whitewashed houses, cobbled streets, and it’s Acropolis overlooking the Golden Bay. Kos is the birthplace of Hippocrates, the father of medicine. Immerse yourself in the history of this beautiful island, including the Castle of the Knights, and its museum houses that represent a collection of the Hellenistic & Roman periods. The small port of Mandraki will offer a variety of trendy boutiques and quaint tavernas. Kos also boasts some of the nicest beaches of the Dodecanese. Samos is fast becoming one of the most popular islands in Greece and its pristine beaches, and picturesque terrain make it a natural choice for visiting the Dodecanese. Located only a short distance from mainland Turkey, ferry boats depart daily for the Turkish port of Kusadasi and a chance to visit the magnificent excavations of Ephesus.